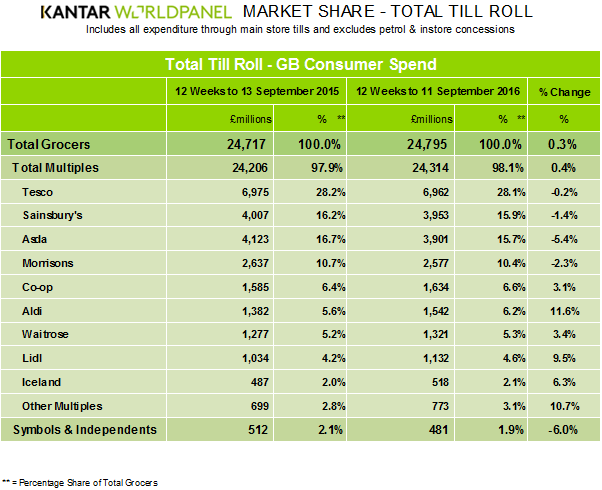 The latest grocery share figures from Kantar Worldpanel, published today for the 12 weeks ending 11 September 2016 show that despite continued deflation of 1.1%, supermarket sales increased by 0.3% with particular growth in alcohol as shoppers celebrated Britain’s summer of sporting success. Fraser McKevitt, head of retail and consumer insight at Kantar Worldpanel, said: “While overall sales growth has been slow, consumers have been keen to celebrate Britain’s Olympic and Paralympic golden summer, boosting alcohol sales by 8.5% in the past four weeks. Sparkling wines including Prosecco and Champagne led the way with growth of 36.0% as promotional events across a number of retailers successfully tapped into the nation’s celebratory mood. McKevitt continues: “Waitrose sales increased by 3.4% on last year, helping the retailer reach a new record market share of 5.3%. It’s ‘Half Price Event’ boosted performance across much of the store – particularly in household and alcohol. However the increase in sales has come at a cost, with Waitrose’s proportion of promotional sales reaching a higher level than some of the traditionally more promotion-focused ‘big four’ retailers. Iceland’s recent run of success continues as sales grew by 6.3% compared with a year ago, with its core ice cream and frozen fish categories particularly over-performing. At Sainsbury’s sales fell by 1.4%, as McKevitt explains: “Overall prices have fallen at Sainsbury’s, as have its levels of promotional activity as it continues to roll out its simpler pricing strategy. Meanwhile, after posting like-for-like growth in last week’s trading update for the first half of 2016, Morrisons’ market share fell by 0.3 percentage points to 10.4%, reflecting its reduced store portfolio. Online sales are becoming more important for the grocer, with shopper numbers up by 45% on last year. Lidl reached a market share high of 4.6% this period having grown by 9.5%, while Aldi increased sales by 11.6%.